If you’re joining me for the first time, allow me to clear up any misconceptions. I’m insane. lol. I’ve decided to hand sew an entire king size quilt out of tiny 7/8 inch hexagons. Why 7/8 you ask? Because I cut out my own templates and I didn’t really know that most hexagons were standardized at 1 inch. Also, making them 7/8 of an inch allows me to get 4 hexagons from each charm square. When means, you’ve got it, there will be exactly 4 of each hexagon in the finished quilt. In an effort to finish this quilt before I’m 95, I set a goal to finish what I’m calling one block each month. A block is 75 hexagons sewn together. Then I go ahead and baste another 225 hexagons each month (the extra 3 from each charm square.) I figure I’m going to need 64 blocks. In October, I finished block number 8 (that I should have finished in September) which means that I am officially halfway through basting hexies! I am also really sick of basting hexies. lol. 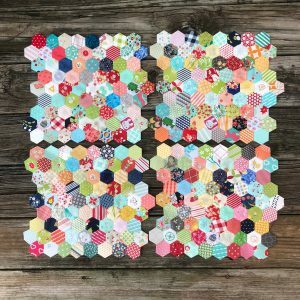 So I decided that instead of moving on to block number 9, I would skip ahead and makes some blocks with some of the already basted hexies. No surprise, but it turns out that it is much much much quicker to put together these blocks. lol. My new plan is to switch off every other month with basting and not. So for November, I’ll do block number 9 and then baste the additional 225 hexagons. In December, I’ll do blocks 20, 21, and 22 which will be made using already basted hexagons. If everything goes to plan, I’ll continue this until January of 2020 at which point I will finish the 16th block. Then just 8 more months of stitching already basted blocks and the blocks will be done! Of course, then I will still need to make some more hexies to join all of the blocks, but I figure I’ll worry about that when we get there. lol. And then, because I’m truly certifiable, I’m planning to hand quilt the whole thing. eeep!